Looking for Reasons Home Canning Jars Don't Seal - and how to fix and prevent it in 2019? Scroll down this page and follow the links. And if you bring home some fruit or vegetables and want to can, freeze, make jam, salsa or pickles, see this page for simple, reliable, illustrated canning, freezing or preserving directions. There are plenty of other related resources, click on the resources dropdown above. Jars not sealing is a problem for many new home canners. Once you get the hang of it, you should rarely have a jar fail to seal. My own failure rate is less than 1%. So, here are typical causes for jars not sealing and what to do to prevent it - and save the batch that did not seal! Screw rings (also called bands) are rusty or bent, causing poor contact. 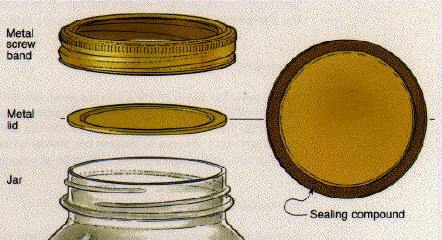 Insufficient processing of raw-packed food - the air may not have been completely driven out of the food, leaving residual air in the jar so the seal does not form. Use of canning procedures which are not recommended, such as open-kettle canning, inversion canning, dishwasher canning, microwave canning and oven canning. Incorrect amount of headspace. (I always maintain at least 1.5 inches of water above the top of the jars. 1. Remove the lid and check the jar-sealing surface for tiny nicks. If necessary, change the jar, add a new, properly prepared lid, and reprocess within 24 hours using the same processing time as recommended in the recipes..
2. Adjust headspace in unsealed jars to 1½ inch (to allow for expansion) and put it in the freezer, upright, instead of reprocessing. 3. Refrigerate unsealed jars and eat canned product within seven days of refrigeration.